FORMER HURLER OF the year Eoin Larkin has closed the book on a glittering 12-year career with Kilkenny. Larkin picked up his first senior All-Ireland medal in 2006, a year after his debut, and would go on to play a key role in the most dominant hurling team of all-time. The 32-year-old won eight All-Irelands, 10 Leinster titles, six National League medals and two All-Stars. He also won two All-Ireland U21 titles with the Cats, as well as the All-Ireland club title in 2005. The James Stephens forward scored 8-134 in 58 appearances for the black and amber. “After due consideration I have decided that now is the right time for me to announce my inter-county retirement,” Larkin said in a statement released by Kilkenny GAA this morning. “I have enjoyed 12 of the best years of my life with success I could only have dreamed of. “It was always my dream from a young age to play, captain and win an All-Ireland with Kilkenny and I’m proud and happy to say I lived my dream. “I am content to walk away now knowing I gave everything I could for myself, but also the team every time I walked out on the training pitch or pulled on a Kilkenny jersey and left no stone unturned in the pursuit of perfection, although I never got close. He also paid tribute to his family and Brian Cody for their influence on him during his career. “I can never thank my wife Anne enough for the last twelve years of support, advice and often a little pick me up when things weren’t going so well. I also want to thank my children Mark, Holly and Ellie for their support and understanding for what I loved doing. It is certainly payback time now. “My sister, two brothers, Paddy, Veronica, extended family and friends always showed me support and were always there to bring me down a peg or two if needed. “I want to thank Brian for the opportunity of playing for Kilkenny and will be forever grateful. I also want to thank all the selectors, backroom staff and medical teams that I’ve worked with. It was often a tough task to keep me fit but they were always more than up for the challenge. “I will continue to play for my beloved James Stephens for as long as I can and will go in search of further dreams. Email “Kilkenny's 8-time All-Ireland winner Eoin Larkin announces his retirement ”. 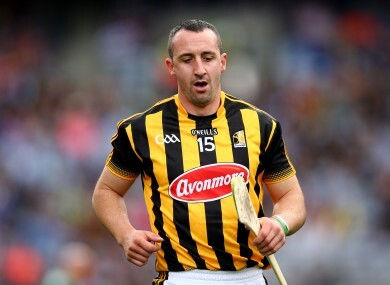 Feedback on “Kilkenny's 8-time All-Ireland winner Eoin Larkin announces his retirement ”.